This article is an extract from a paper published in the Quarterly Journal of Engineering Geology and Hydrogeology (41, p 5-19) in 2008. The paper was originally presented to the Geological Society as the 2007 Ineson Lecture in November 2007. The paper itself provides an excellent historical review of groundwater management in the UK from 1937 to 2006 and a review of current policy and science challenges in groundwater in a historical context. The paper includes a description, presented here, on the growth in demand for groundwater specialists. The number of groundwater specialists working in the UK or from a UK base is now estimated to significantly exceed 1000. This is at least a 60-fold increase over the 60 year period since the enactment of the legislation, in the form of the 1945 Water Act, that initiated a quantitative approach to groundwater management in the UK. It is self-evident that the number of groundwater specialists has grown significantly over the last century, since the creation of the Water Unit in the Geological Survey in 1937. However, there has been no previous attempt to enumerate the growth. 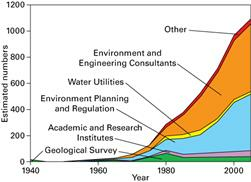 Figure 1 shows an estimate of the growth in numbers of groundwater specialists in the UK from 1940 to 2005. These estimates have been prepared using such information or recollections as colleagues from various sectors of the profession have been able to supply. They are believed to be broadly correct in number and trend within the limits and qualifications set out in the figure caption. The estimates are tabulated in Table 1. In the early 1940s the focus of the Geological Survey on water issues meant that there were upwards of 15 professionals working full time on groundwater. However, that effort was wound down after the war, and a similar number of professionals was not re-established countrywide until the late 1960s. The number has continued to increase, as shown in the figure, and the total number of groundwater professionals in 2005 is estimated to have been of the order of 1100. This number excludes the not insignificant number of UK-trained groundwater professionals working on long-term appointments outside the UK. Other assumptions made in drawing up these data are given in the figure caption (shown on the full size version - click on the image to display this). All sectors have grown but the main growth areas have been in regulatory agencies and in consulting. The regulatory sector has ceased its rapid growth over the last few years but the consulting sector continues to grow, including a transfer of work from government and utilities. There are currently over 1300 Fellows of the Geological Society who are registered with its Hydrogeological Group. Hydrogeology has become a mainstream branch of the geosciences over the course of the last century and groundwater studies have become recognised as a key component in the understanding and management of the natural environment. Many complementary disciplines in physical, biological and social science are now engaged in work on groundwater. The demand for groundwater specialists therefore seems set to continue to rise. As the UK Groundwater Forum review of the availability of candidates for groundwater-related jobs in the UK in 2007 showed, there is a significant challenge in meeting this demand.